Duplication of the Richmond Line began in 2002, when it was duplicated through to Quakers Hills. Plans to extend the duplication were then announced in 2003 as part of the Clearways Project, which sought to increase capacity on the existing network by removing bottlenecks rather than by building new lines. This extension was split into 2 parts: the first between Quakers Hill and Schofields, the second between Schofields and Vineyard. While the second part was deferred, and now appears to have been scrapped entirely, the first was completed in 2011. This was not without its controversy. The duplication required the demolition of the old station, which had only a single platform, and the construction of a new station located 800 South of the existing one. The long term plan is to develop the area around the new station with shops and housing, however at the time of opening there was little more than a few houses and an empty paddock on each side of the station (see images below). This has left the old town centre isolated from the new train station. It has also moved the station a 10 minute walk away from where it used to be, which for many locals would have been literally on their doorstep. Probably because of this, there was little celebration when the new station opened, with the government not even acknowledging the opening of a new piece of transport infrastructure. Keep in mind that this is a government that has made transport infrastructure its number one issue and that there will be no new transport infrastructure projects opened until the Dulwich Hill light rail extension is completed in 2014, not long before the next state election. 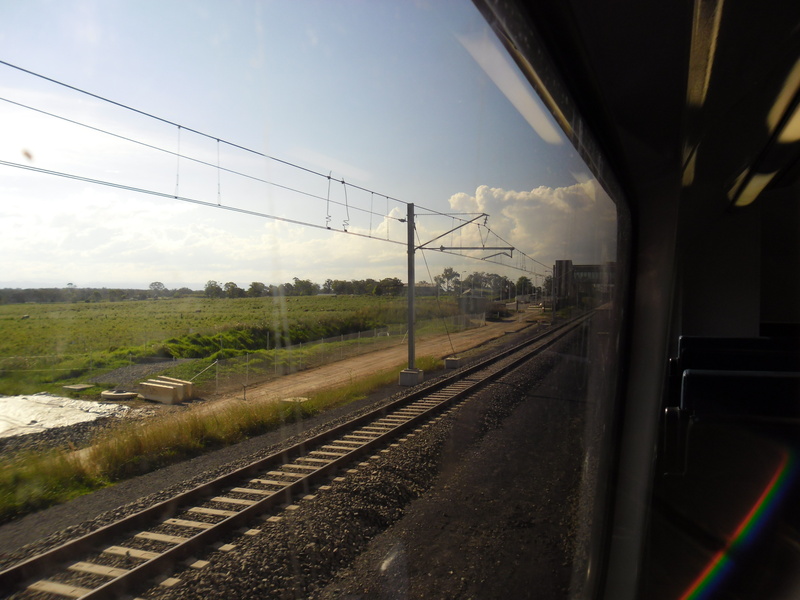 Going forward, it is possible that the Northwest Rail Link may also be extended through and past Schofields, making this station an interchange between the Northwest’s 2 major rail lines. The Cronulla end of the Illawarra Line was one of the last to be electrified, but also one of the first to be electrified through to its terminus. However, despite some duplication of track in the 1980s, it was not until 2010 that the line was fully duplicated all the way between Sutherland and Cronulla Stations. This lifted the cap on the number of trains that could travel along what was previously a single track of rail. In conjunction with improvements on the city end of the line, including the construction of the Eastern Suburbs Line (which moved Illawarra Line trains from the City Circle and sent them towards Bondi Junction instead) and then the completion of a turnback at the Bondi Junction Station terminus (increasing the capacity at that station from about a dozen trains per hour to 20 trains per hour), this allowed a significant increase in the total peak capacity of the line. As a result, it is now possible to easily run 20 trains per hour on the Eastern Suburbs/Illawarra Line. 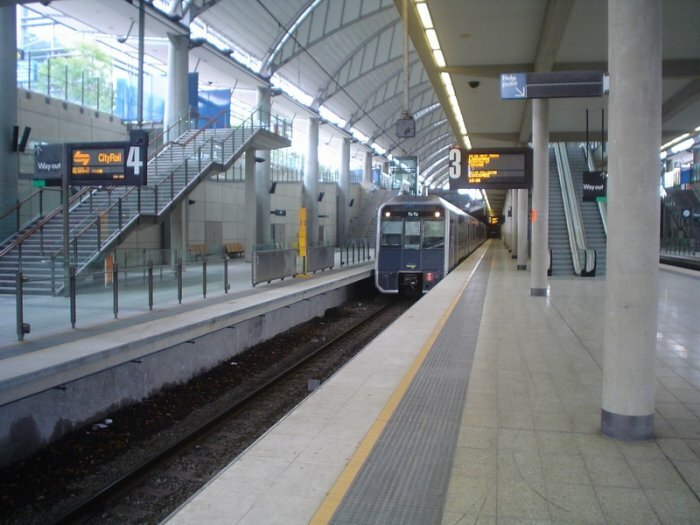 The Epping to Chatswood Line began its planning stages as the Parramatta to Chatswood Rail Link, part of the Carr Government’s 1998 Action for Transport. The line would actually run from Westmead, going to Parramatta, then joining up to a duplicated Carlingford Line, followed by a tunnel to Chatswood via Epping and Macquarie Park. By the year 2000 the project was so certain to happen that we even saw it on the maps in every train station and in every train carriage (see below). For anyone who forgot to turn their sarcasm detectors on, that last sentence is not to be taken seriously. Originally to be up and running by 2006, the line was truncated in 2003 to just Epping to Chatswood due to concerns over the cost (a mere 3 months after Carr’s 3rd election victory, I’m sure the timing was purely co-incidental). Even then it was not completed until 2009, longer, more expensive and without one station originally planned for. More on this further down, first I’d like to focus on the Westmead to Epping portion, what is now termed the Parramatta to Epping Rail Link (PERL). A Department of Planning report on the Parramatta to Chatswood Rail Link from 2002 outlines what the line from Westmead to Epping would have looked like. The line would join up to the existing track at Westmead before going underground, necessitating an additional set of dives which would require space either from the Parramatta Golf Course or Parramatta Park, both of which were adjacent to the line between Westmead and Parramatta. At Parramatta, an additional underground platform would be built just North of the existing station (underneath Darcy Street). This would then continue underground, going East until they reach the Carlingford Line at Rosehill Racecourse, where the tunnel would follow the Carlingford Line alignment North until it reached a new station underneath the Grand Avenue bridge. This new station would be an amalgamation of the nearby Rosehill and Camellia stations and also link up with the Parramatta to Strathfield bus transitway (which was never built either). Between the old Camellia Station and Carlingford, the line would continue mostly unchanged other than with the addition of a second track. At Carlingford a new station would be built underground, with a tunnel connecting Carlingford up to the underground platforms at Epping. Though this plan was scrapped, a plan was later announced to build a passing loop on the Carlingford Line, which would allow 2 trains an hour, rather than the current limit of 1 train per hour. However, this too would also be scrapped. One thing that was done right was future-proofing, and both ends of the Epping to Chatswood Line have been left ready for expansion. On the Chatswood end, there is space for an additional track pair between Chatswood Station and St Leonards Station. 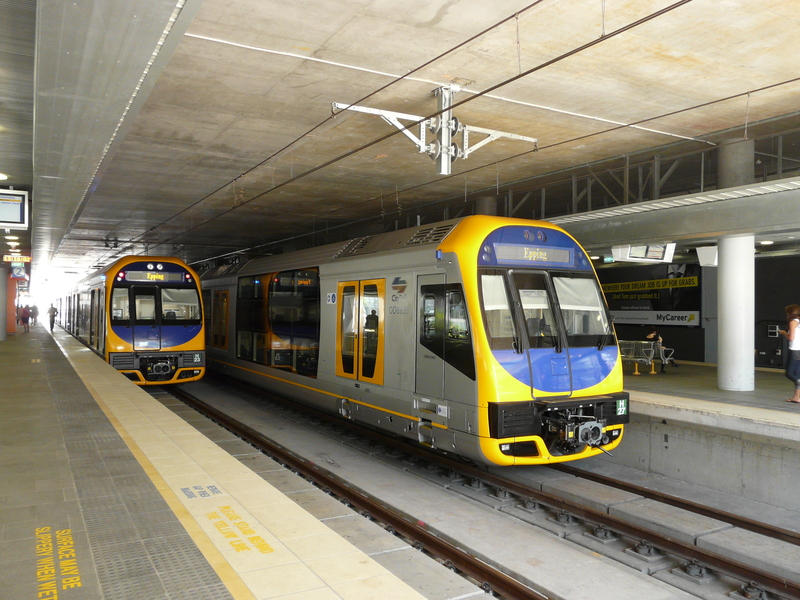 Both stations either have 4 platforms (Chatswood) or have space to run additional track along them to become a 4 platform station (St Leonards). This leaves open a potential Chatswood to St Leonards quadruplication, which is one step in an eventual new line through the CBD. The Epping end of the line has stub tunnels on the Northern end of the underground track at Epping Station. This would allow for a future PERL to be built with minimal disruption when it was connected to the existing network. Almost ironically, it appears that these stub tunnels will instead be used to connect the network to the Northwest Rail Link (NWRL), which will also have a set of stub tunnels for a line to Parramatta. As a side note: the decision to have the NWRL join up at these stub tunnels, rather than further North above ground, has been seen as a controversial decision as it limits the options for trains from the Northwest (i.e. they must go via Chatswood and do not have the option to go via Strathfield). However the O’Farrell government has defended this decision, pointing out that using the tunnels is cheaper than going above ground as it avoids expensive land acquisition and that to do otherwise would delay the project by requiring new plans, investigations and impact studies to be carried out. The truncated line, from Epping to Chatswood, was initially meant to have 4 stations – 3 at Macquarie Park and one at UTS Ku-rin-gai. However, protests from the public meant that the line was re-routed underground, rather than crossing over the Lane Cove River. This meant that the line would be too deep underground for the Ku-ring-gai Station, while also increasing the cost of building it and lengthening the journey time. Many of those opposed to the bridge option did so on environmental grounds, an ironic argument seeing as improved public transport would have done far more for the environment than preventing the construction of the rail line on the original alignment. The changes also meant that the gradient were now too steep for Tangara trains to run on the line. As a result, the line was initially serviced by OSCARS. This was done as a shuttle service at first, running between Epping and Chatswood, but was later integrated into the Northern Line. The long term solution to this capacity problem is to build a second harbour crossing. This would join up to a City Relief Line which, as mentioned earlier, would result in a new line running through the city, the first new line through the city since the Eastern Suburbs Line opened in 1979. Doing so would mean a 33% increase in capacity through the CBD. Alternatively, a metro conversion proposal has also been floated as a cheaper alternative to increasing capacity across Sydney Harbour. The NSW government has a history of duplicating the Richmond piece by piece. 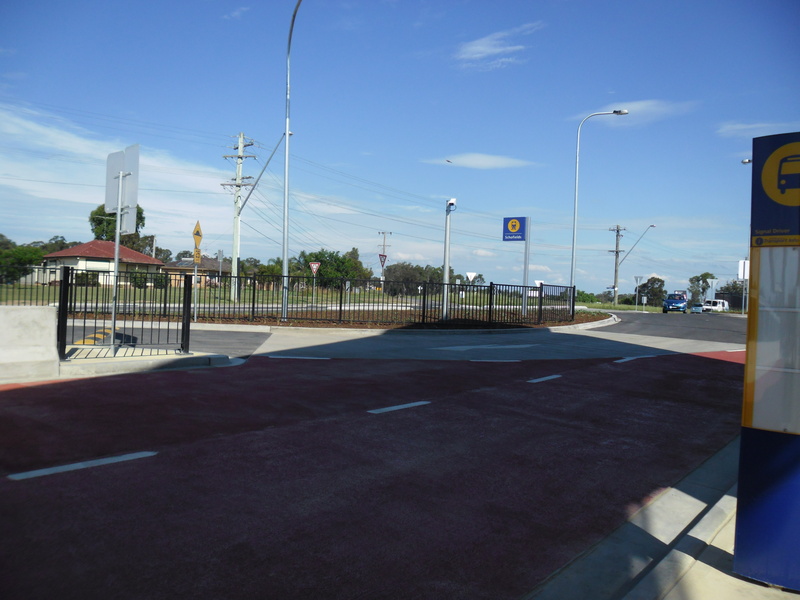 The first piece was a duplication through to Quakers Hill. This has allowed additional trains to run between Quakers Hill and Blacktown. So whereas the rest of the line through to Richmond is limited to a frequency of 2 trains per hour (TPH), Quakers Hill manages 6TPH during an hour in the morning peak and 4TPH during an hour in the evening peak. Plans are currently in place to duplicate the line through to Vineyard. 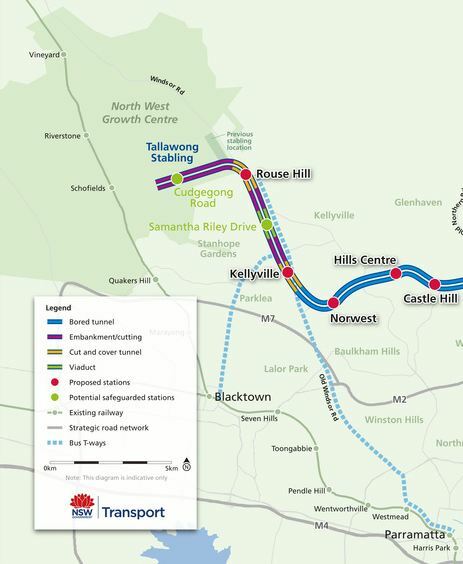 This will result in the 4 stations in proximity to the Northwest Growth Centre (NWGC) – Quakers Hill, Schofields, Riverstone and Vineyard – having a complete track pair running through them. There are an additional 70,000 dwellings planned for the NWGC over the next 25-30 years, which will see an additional 200,000 people reside in the area. Duplication of the Richmond Line is one strategy the government has to provide additional transport infrastructure for the area (as clearly a single track of heavy rail will be insufficient). Interestingly, the Northwest Rail Link as currently planned only barely penetrates the NWGC (see map). However there is significant scope in place to extend it through to Schofields Station, Marsden Park and then the Western Line, probably at Mount Druitt, thus linking it up with both the Richmond and Western Lines. This remains idle speculation at this point, and is little more than a “long term corridor” to be considered post-2040. Two new lines were constructed in preparation for the 2000 Sydney Olympics. The first one to open was the Olympic Park Line to the main Olympics site, and opened many years prior to the games. The second, a line to Sydney’s Kingsford-Smith airport, did not open until the year 2000 itself. Constructed in conjunction with the private sector, this would be the first rail Private Public Partnership (PPP) in NSW and was considered such a failure that no future rail projects since (other than the Waratah trains) have made use of PPPs. The line consisted of 5 new stations, one South of Tempe (Wolli Creek) and 4 underground stations between Wolli Creek and Central (Domestic and International Airport stations, Mascot and Green Square). The 4 underground stations have a very modern subway feel to them, much like the Eastern Suburbs Line before it or the Epping to Chatswood Line after it. These 4 stations are also privately owned and operated, with the track and trains publicly owned and operated. What this means is that the private operator charges a station access fee to anyone wanting to get on or off at one of these stations (though not to anyone merely passing through them) and requires Cityrail to run a minimum number of trains each hour through these stations. 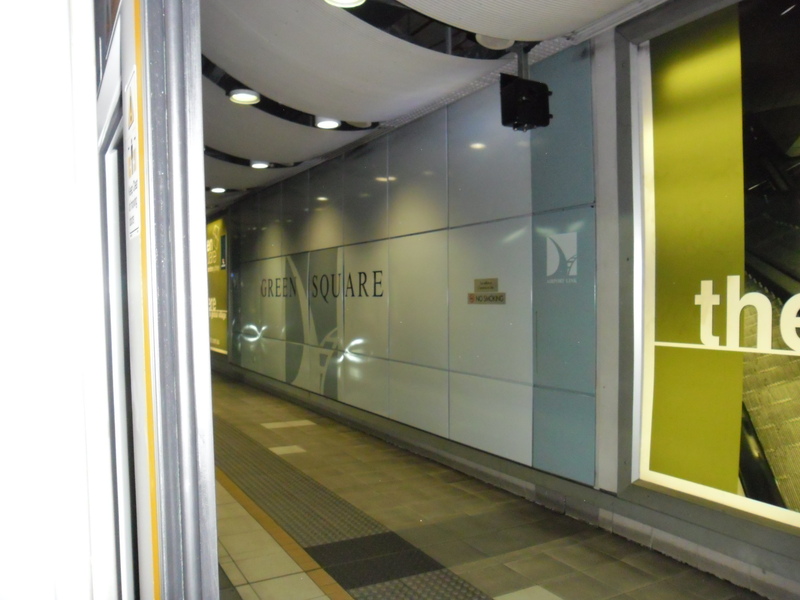 This access fee was relatively low ($2.60) for Green Square and Mascot, which are suburban stations, but much higher at ($11.80) at the two airport stations. As this was on top of any regular fare, it meant a single adult fare from Central to Domestic Airport Station cost $15.00 in 2011. Given a large proportion of people using the airport stations are not residents of Sydney (or even Australia) and that the cost of transport from the city to the airport is similar in Melbourne ($16 on the Skybus), I actually think this is an appropriate price and to subsidise it would mean subsidising foreign tourists as well as locals. This thinking was probably part of the reason why in 2011 the NSW government decided to eliminate the station access fee for the 2 suburban stations, but not the 2 airport station. (It did this by agreeing to pay the access fee directly to the private operator, rather than requiring passengers to do it). This proved to be hugely successful, and 3 months later patronage had surged by 70% (compared to 20% growth that the line has seen in previous years). Talk later emerged of a possibility of extending this to the airport stations, perhaps as a 50% subsidy rather than full elimination of the access fee, but nothing subsequently materialised. Wolli Creek station is worth mentioning. It was built on the Illawarra Line just South of where the East Hills Line separates from it and goes West toward Campbelltown. The new Airport Line runs perpendicular to the Illawarra Line, connecting up with the East Hills Line in its Westward direction. This new line runs physically underneath Wolli Creek and has an additional 2 platforms along with the 2 platforms for the Illawarra Line trains, allowing passengers to transfer from Airport Line trains to Illawarra/Eastern Suburbs Line trains or vice versa. The Airport Line had a major benefit of helping to untangle the Cityrail network. Most trains on the East Hills Line (and all during the off-peak) now travel to and from the city via the Airport Line rather than via Sydenham (which is now used almost exclusively for Illawarra and Bankstown trains). This increased the capacity into the city from the South from 2 track pairs to 3 track pairs. However the real benefit comes from untangling the complex web of lines that make up the Cityrail network. What it now means is that any delays between Tempe and Redfern will often not flow on to East Hills Line trains, as (other than a few express trains during peak hour) they do not use that part of the network anymore. Plans for the Olympic Park Line were begun after Sydney won the rights to host the 2000 Olympic games in 1993. The games were to be held on a former military and industrial site in Homebush Bay, which had an existing freight rail line. This line would be eventually converted into the Olympic Park Line, served by a single station: Olympic Park Station. Trains to the station today are mainly shuttle services, running every 20 minutes on weekdays and 10 minutes on weekends, stopping at Lidcombe Station (on a dedicated “Sprint Platform”, nominally Platform Zero) and Olympic Park Station. During major events, additional trains will also go to Olympic Park Station from Central. There are also a few interurban trains from the Blue Mountains that go into Central Station which then go to Olympic Park Station before dead running to the Flemington stabling yards to be parked during the off-peak. Olympic Park Station is unique in that it has 2 platforms for each train, with passengers on the train alighting on one platform and other passengers boarding from the other platform on the other side of the train. This prevents any conflicting movements of passengers getting both on and off at the same time, reducing dwell times and allowing a more efficient movement of passengers. This was particularly useful during the Olympics, during which huge numbers of people had to be moved to and from the Olympic Park all day. However, this function has been rarely used since the Olympics (if all at). Next week: The Airport Line. Completed in 1996, with funding from the federal government’s Building Better Cities program, the Cumberland Line was really in effect just a few extra kms of track and a flyover. However, its effect was to allow trains on the Western Line coming from Parramatta to travel directly through to Liverpool on the South Line. It remains the only true radial line in the Cityrail network (not counting the Carlingford Line), as it never actually passed through the CBD. Instead, it connects a number of centres in Western Sydney, including Blacktown, Parramatta, Liverpool and Campbelltown. As far as train lines go, the Cumberland Line is as small as you get, as it uses existing track for most of its length, and was created through the construction of a Y-link. The Cumberland Line originally had a total of 70 half hourly services in each direction all day. These were slowly reduced until the 2005 timetable changes, with its need for additional rolling stock to deal with longer journey times, resulted in only 2 services to Parramatta in the morning and 3 services to Campbelltown in the evening. It is more heavily used when trackworks or network disruptions occur, allowing trains to be re-routed to the Cumberland Line rather than terminating. Today the Cumberland Line is one of the biggest examples of spare capacity on the Cityrail network. In recent years there have been proposals from both major parties to resume half hourly services on the Cumberland Line, but despite this it remains at 5 services per day. Next week: Olympic Park Line.